Common trade names include Alloy C276, UNS N10276. Nickelvac® HC-276, Inconel® 276, Nicrofer® 5716. Alloy C276 is considered among the list of Superalloy products. Superalloys (or special metals), are used in severe environments for their capability to handle corrosive situations. Hastelloy C-276 is a nickel-molybdenum alloy with elements of chromium. This material has excellent corrosion resistant properties and is known for its extensive use with chemical and waste processing. Resistance to stress-corrosion cracking and pitting is high. It is considered to be moderately difficult to machine, due to the quick hardening of the alloy. Hastelloy C-276 is a good choice of alloy if versatility and high resistance to reducing and oxidising acids is required. 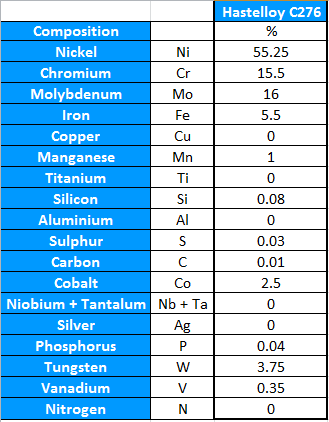 (Table) shows the material composition of the alloy C276. Nickel 55.25%, Chromium 15.5% and Molybdenum 16%. The properties of this alloy allow for fantastic corrosion resistance in areas of aqueous corrosion. The table below shows Hastelloy C-276’s corrosion resistance in a number of areas against our standard stainless steel 316 grade material. *Do Not Use: This indicates that the metal is not recommended for use with the media listed due to corrosive attack. Severe corrosive attack on metals will decrease the safety and efficiency of the installation. Weakening of the metal will cause Health and Safety risk factors either immediately or gradually, depending on the concentration of the corrosive media. Hastelloy is available from Waverley Brownall in both fittings, tubing and valves, such as check and needle valves. Tube fittings in alloy C-276 are good for use in water treatment and chemical applications. It is an alloy that is almost unmatched for its capabilities in seawater under crevice conditions. Standard sizes for Hastelloy C-276 tube fittings are up to 1” or 25mm tube OD sizes. We can provide metric and imperial sizing guides on request. Bespoke C-276 fittings and valves require large quantity orders. With the costly raw material and machining difficulties, Hastelloy C-276 fittings will be roughly 9.0 times the price of our stainless steel equivalent. Industries such as Chemical processing and Oil and Gas invest in this alloy for a durable and safe material choice that is long-lasting. It is reliable in many areas where alternative alloys struggle. We supply tube to UK and international addresses. Nickel-molybdenum-chromium alloy tubing provides great corrosion resistance. Tubing can be provided with alloy 625 fittings, components and valves for complete installations in the Hastelloy C-276 material. Waverley Brownall recommends a review of the Health and Safety requirements for the intended use before purchases are made. The correct material selection is vital for adequate performance with high temperatures, pressures and corrosive media. Our tube fittings are not interchangeable with compression fittings or valves from other manufacturers. Other specifications exist for round bar, wire and forgings. Hastelloy C-276 alloy, Corrosion Resistant Alloy from Haynes Int.